This is an exciting time for transition year students. They have just completed their first State exams and are looking forward to a year of activities that will give them an insight into the world out there. This day at Kippure Estate is ideal for getting students who have been friends for the last few years to expand their networks beyond their usual group. Our ice-breakers are the perfect way to start the team development day as they encourage laughter and make everyone feel at ease. Then we move straight on to our High Ropes course, where the students are encouraged to work as a team, trusting in and supporting one another by holding the rope for those up above. During this challenge, your transition year students will step out of their comfort zone and feel a great sense of achievement at the end. 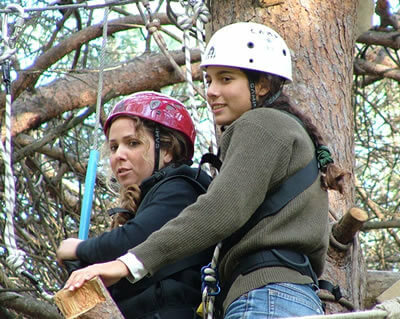 We fully appreciate that there will be some students who feel uneasy with the heights on the high rope course, so our days include a number of other activities which offer something for everyone. We also include a Low Ropes Challenge Course, which is a mere foot off the ground, yet offers more opportunities for team building as the students must still support one another along the course. Our Jungle Swing is another highly entertaining course which is brilliant for fostering team spirit. It is actually impossible to achieve the final goal individually so good teamwork is essential. Groups need to formulate a strategy for completing the course, abiding by some simple rules as they go. More planning and teamworking is required for our fixed Orienteering course, which also demands both logic and good time management. All of these skills will be tested to the full during the final two years of school, as these students prepare for the next State exams. And of course, knowing how to read a map properly is one of life’s basic survival skills! Throughout the day, we actively encourage feedback by reviewing each activity session as we go. Students will share with the group what value they have taken away from the events, both individually and as a team. All of our activities have been carefully designed to ensure the group mixes up as much as possible, allowing students to interact with others who they might not normally come across. In many cases, we find new friendships are formed which come to last beyond the school years. This is an exciting, challenging and often daunting time for students and our team building days have also proven to be fantastic in building motivation and improving self-confidence. Our days of activities for transition year students can be tailored to your exact requirements so whatever you want to focus on most, we can provide you with the best possible itinerary to ensure your students walk away feeling inspired, exhilarated and excited about their future – as a team.